Atelier Sophie: The Alchemist of the Mysterious Book is essentially a story about a girl, Sophie, who wishes to become as good as her grandmother at the art and science of alchemy, but is quite the beginner at it, which seems to be a theme found in at least one other Atelier title: Atelier Annie: Alchemist of Sera Island for the DS (here: Atelier Annie). Sophie continuously messes up recipes and cannot seem to do it right, despite her determination to become the alchemist upon whom everyone in the town relies. The book (Plachta) in which she writes down the recipes she discovers turns out to be a magical book that can talk and apparently is not impressed with Sophie's attempt of making the Berg Medicine; even so, Plachta is willing to assist Sophie in her mission. This ultimate goal is refreshing: she knows more or less exactly what she hopes to achieve, but how she will go about this (given her inexperience) is fuzzy at best. This contrasts with other RPGs where the main characters early on in the story know that they are chosen, will be great, and will somehow save the world. ...thereby engaging the player in her world and her mission to become great at alchemy (and also assist Plachta in restoring her memories). We are all passionate about something such that we easily lose ourselves in it; Sophie has a certain depth not readily found in other protagonists, and the scope of her mission makes her character even more personable (it is not exactly easy to identify with a character whose mission is to save the world, for instance). This general excitement is captured perfectly in the song after the prologue – a fantastic and ethereal piece. The way it is paired with the opening story is superb and excellently executed. Although I do not know Japanese (and the song was in Japanese), it does have a way of letting you know that this is a grand tale: we are about to embark on a journey and you (the player) are invited to join. This alchemy system is the cornerstone of this title and synthesis (creating items in the cauldron from various ingredients) takes some getting used to (it plays like a mini puzzle-style game) if you want to produce more effective items. Synthesis is not exactly hard, it just requires some planning, and since you are allowed to redo the placement of materials, the mechanic is not unforgiving. Later on, new cauldrons with different sized grids, and with their own perks, can be unlocked or bought and used. Deciding which cauldron to use for a synthesis can depend on a variety of factors, such as the size of ingredients, what bonuses the cauldron can offer, and so on. Getting an item above the quality of average and discovering new recipes is, however, the challenge. I am unsure if other Atelier titles have a similar way of synthesizing items or not, but the mechanic here is fun and makes the process more interactive than if it had been merely choosing ingredients and clicking "synthesize" with no further action required. The synthesize mechanic also introduces some strategy (one must work at becoming better at this, and part of this is noticing what works and what does not, in terms of ingredient placement on the grid) and resource management (for example, if there is an ingredient you have that has a trait that increases attack, you would not necessarily want to use that ingredient for creating an item that is not used offensively), but materials are abundant and quickly respawn, so this is usually not an issue. After exploring a given area/field so many times, enemies found therein begin to increase in level, such that the hardest enemy you find is seemingly always a higher level than the characters – before my crew had hit level four, the enemies I came across were levels four to seven. Monika nearly died in just one battle. This is a bit concerning for those who enjoy being able to grind, level up, and take on groups of enemies with ease and for an extended period of time; but, one should keep in mind that the primary focus is to become a master alchemist, not necessarily to be the fiercest warrior of the lands (although leveling up will be crucial to this, as later fields host stronger enemies). Hence, while this enemy scaling does force a player to make the most of each exploration trip, it is not that major a point; one might nevertheless fear that he is not playing this correctly or making efficient use of each trip and that enemies may get to the point that they are downright undefeatable and will only keep increasing in level. Theoretically, one could stay in one area, continuously kill enemies and gather materials – for each time one kills a group of enemies, materials appear; and for each time one harvests materials, a group of enemies appear – but this is limited by your characters' health and “LP,” which is a sort of energy level; lower amounts of this stat is a bit similar to your character being fatigued, for his or her stats will temporarily decrease until LP is replenished. I assumed this plan would have averted enemies leveling up (based on the assumption that it was based on of how many times one has visited that given area), but this phenomenon seems to be more related to how much you have harvested from that area, for after harvesting, I noticed this white circle appear at the bottom-right corner of the mini-map. This is what is known as the “gathering level,” and it maxes out at five. However, when one exits an area and later returns to that area, the gathering level resets (but is easily brought back up again by harvesting), and enemies found there reset back to the original level that you first found them. Hence, ultimately, it seems as if the player can experience combat and enemy scaling at one's pace, thereby providing a sort of relaxed gameplay. Don’t want to face harder enemies that are at a level greater than yours? I also notice that, at least when one area's gathering level increased from one to two, there was not really an increase in level of enemies (perhaps just an extra enemy in a battle), or – from gathering level two to three – just a one level increase for the blue Punies as opposed to some other areas where a blue Puni could go from level one to level four. Also keep in mind that this, upon first glance unfair, enemy scaling is easily mitigated by the use of what you synthesize, and as noted earlier, one can head back home and then return, so that the gathering level will reset and enemies will be a lower level again. Materials are in abundance, use them; stock up on a supply of items for both healing and offensive purposes. This way, an enemy that was twice my level (eight, while my characters were at level four) was taken down with ease using a few "uni bags,” which act almost like a bomb, but weaker; it is worth noting that I faced this enemy at night, when stronger enemies appear. Hence, as far as strategy is concerned, if you have a decent supply of items at your disposal, there is not much reason to worry about strategy, at least on the normal difficulty (there are two levels higher than normal difficulty for those who are looking for something at least a tad more brutal, and difficulty can be changed at any moment in the settings). Cole (the currency unit) is obtained not by enemies (they may drop a few every so often, but do not count on this as the main way of making money early on) but rather by random events on the world map and by completing requests. 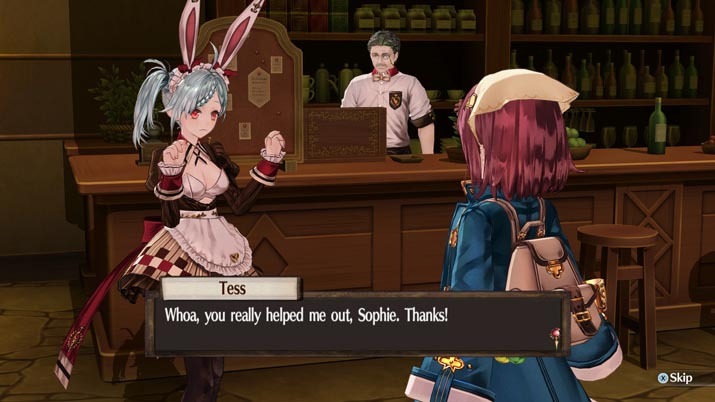 Both pay somewhat well, and Cole can be used to purchase supplies from stores – and sometimes buying a particular ingredient gives Sophie inspiration for a new recipe. Some of these requests have a time limit, but often, if not always, this is twenty days (within the world of Atelier Sophie). 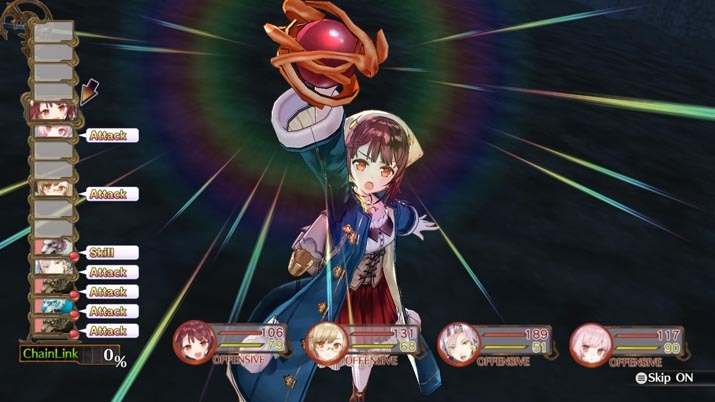 There do not seem to be any strict deadlines, or at least any that would have dire consequences upon incompletion; this contrasts with prior Atelier titles (but not all of them) such as Atelier Annie, where every few months or so (six months for Atelier Annie, at least for the first main task), an assignment must be completed and should the player fail to complete said assignment a game over ensues, inevitably making Atelier Sophie more relaxed than at first glance, given lack of a time-limit system. One just needs to get the hang of how the combat system works in conjunction with (and complemented by) the alchemy mechanic. Strict deadlines would give the player more structure and make for a challenging run-through, but for those that would rather opt for something laid back and calming, this may be the Atelier for you. The world starts off as being small – only one field can be explored when you begin, but it quickly expands once certain alchemical milestones (that is, after you produce a bomb in your cauldron) are achieved. Plachta reveals to Sophie at these moments that she has remembered more fields to explore and from which to gather materials; often three or four fields are uncovered each time, and some of these offer more than one spot to explore. What I mean is, you enter the area, and some exits may lead you to additional places within that single area (sort of how a dungeon in some RPGs can have more than just one room). The town also expands, for new shops become available after certain people have been met. There are a few minor hiccups, however. Upon launching the game, if I try to modify any settings in the configuration section (such as screen resolution), the program instantly crashes. This is not too much of an issue, although I do prefer playing full screen. Using a mouse to play felt awkward, so a controller may be recommended: the button mapping here is intuitive and feels natural. Also, it seems that in certain cutscenes where one would expect voice acting, there is none (at least when using the English settings); this also occurs when speaking to townsfolk outside of a cutscene, but when switching to the Japanese settings, there is some voice acting in this situation. This gives the sensation that this aspect is incomplete and is slightly disappointing for those who opt for the English setting. Atelier Sophie offers a fantastic experience, with its refreshing motivation behind its story and the ultimate goal of the main character, along with good character depth and development. The gameplay itself is not particularly linear, strictly speaking, but nor is it wholly non-linear – you have to achieve milestones to really advance the story, and this, in turn, unlocks new maps to explore. Other than the resolution bugs, and the random lag when performing an action (whether in battle or simply searching through one's inventory) that results in a brief loading of the consequence of that action, this title plays smoothly. 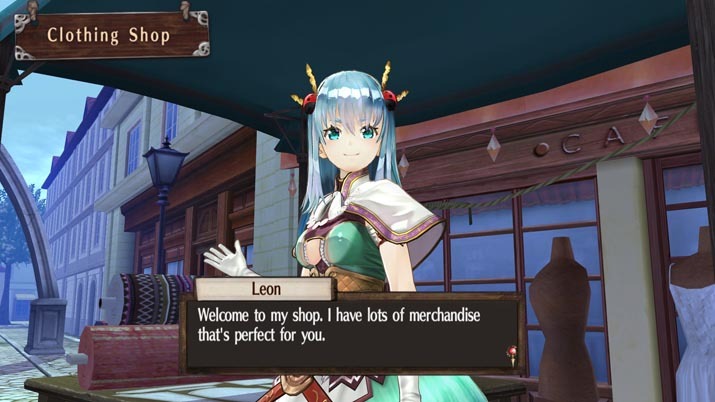 Some players may not enjoy the English voice acting, but I found Sophie's rather convincing; it seems to fit perfectly with her personality, which is, especially at the outset, rather naive, inexperienced, and even airhead-ish as one commenter noted in an article published on Silicornera by Sato on the Japanese version of Atelier Sophie. As the story progresses, she begins to gain confidence in herself (or, she feels more assured with Plachta's help) that she will eventually accomplish her mission; in this regard, her determination never wavers.